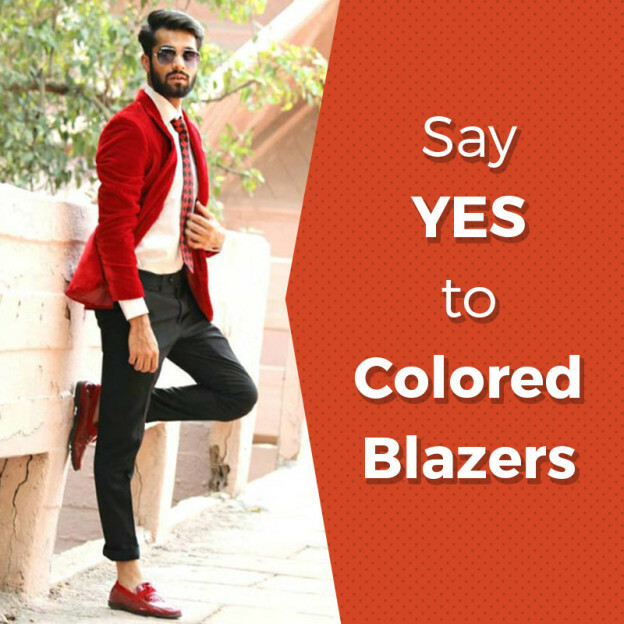 Say YES to Colored Blazers! Men's fashion is now becoming more diverse. Those days are gone when men use to wear boring staples from their wardrobe. Choosing a contemporary style is all about adding a glance to your personality and having fun with your wear. A colored blazer is a perfect example for this. It's not necessary for you to wear this blazer regularly but on a certain occasion, they are a big YES. Basically, a colored blazer is the perfect statement piece for your wardrobe. It's easy to wear and if you don't feel comfortable, you can remove it. One of the most stylish colored jackets you must have is a light blue blazer. It gives you a fashionable look without overburden. Try wearing this color in the summers, this make will make you look cool and fresh. If you are thinking to go for a casual look, pair your blazer with dark colored jeans, but if you want to mix it up a little bit, burgundy or beige trousers with a crisp white tee would look great with a light blue blazer. If you want a smarter look, wear navy trousers but if you want a bolder look, try a pair of white or beige trousers. For more elegance add a tie to complete your look. Thinking about wearing a red blazer can be a scary thought, but honestly, it looks good when opting in a right shade. You can wear red for your casual occasions in the summers or you can choose a burgundy color for formal events in the winters. Pastel shade blazers are always on trend, they look good in the sunny days and also keep you cool, the reason being they don't absorb heat as compared to darker colors. Tan blazer is considered as an inoffensive color, but they are a must have addition to your wardrobe. They have a tendency to lighten up your look unlike black or traditional navy color. Tan color looks sophisticated and classy with black and white, summery with blue and stylish with burgundy. So, take your favorite pick. A white color blazer would look good when styled with a dark colored shirt. A personal tip would be wear with a patterned shirt that has white in it, this will make you look cohesive. For trousers, blue color would be good enough. On That Note: So, Gentleman! Don't restrict yourself with colors rather experiment your looks with every color. You can start with neutral colors and then, later on, opt for dark colors. But make sure you carry it with confidence.